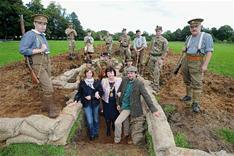 Glasgow's Lord Provost Sadie Docherty witnessed the start of work on 'Digging In', an ambitious reconstruction of First World War trenches in Pollok Park. The Lord Provost met lead project partners, including Dr Tony Pollard, Director of the Centre for Battlefield Archaeology at the University of Glasgow and Dr Olivia LeLong of Northlight Heritage, as well as re-enactors in First World War costume and members of the University of Glasgow Officer Training Corps who were busy digging a practice trench. The Lord Provost, currently leading the city's four-year First World War Commemoration programme said: "Digging In is daring and I'm sure it will prove a huge hit with everyone who visits. Pollok Country Park is a great asset to the city. Already home to the renowned Burrell Collection, this new and exciting educational development will allow us all to better appreciate the experiences of soldiers on the Western Front and the impact on communities at home." The bold initiative is designed to raise awareness of the Great War and offer children and adults a truly interactive experience of life in the trenches. It will involve the construction of Allied and German trenches being built as authentically as possible to the period. The venture is led by a partnership involving Northlight Heritage, Glasgow City Council, the University of Glasgow and Stewart's Melville College. Thanks to National Lottery players, a grant of more than £99,000 has been awarded to the project by the Heritage Lottery Fund. Work begins on Digging In on Monday 10 August with the building of the site's perimeter fence.